Swarms at Sea and Out-swarming the Swarms? This week Foreign Policy posted a new article by Navy Postgraduate School professor John Arquilla, in which he discusses the how “swarm” tactics employed by the Russians caused the failure of Napoleon’s 1812 invasion. Arquilla is a prolific author who regularly writes about swarms and “net-centric” operations. In the above piece he cites successful maritime employment of swarm tactics such as German submarine “wolf-packs” in the Second World War and the Sri Lankan Navy’s fight against maritime elements of the Liberation Tigers of Tamil Eelam (LTTE, or “Tamil Tigers”) earlier this decade. It is unclear how Arquilla’s example of the Russian defeat of Napoleon is applicable to a broad range of operations at sea, however. 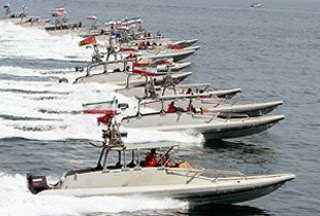 When swarms are discussed in terms of maritime operations, it is generally in the context of an asymmetric fight within a constrained body of water, such as Iranian plans to use swarms of small boats or the Chinese Type 22 Houbei fast attack craft. Napoleon’s Grand Armee was vulnerable to Russian swarm attacks on the march back from Moscow because of its extended supply lines. In contrast, one of the primary advantages of sea power is that it provides the space for strategic maneuver and the ability to avoid such exposure to swarms. Swarms and Anti-Access/Area Denial (A2AD) weapons and tactics could still threaten naval forces within specific areas in which the ability to maneuver is restricted, or are within the range of weapons on land, but they do not take away one of the main advantages of sea power, the ability for a state to choose where to best deploy its forces. Lieutenant Commander Mark Munson is a Naval Intelligence Officer and currently serves on the OPNAV staff. He has previously served at Naval Special Warfare Group FOUR, the Office of Naval Intelligence and onboard USS ESSEX (LHD 2). The views expressed are solely those of the author and do not reflect the official viewpoints or policies of the Department of Defense or the U.S. Government. As fighting continues Friday between Israel and Hamas, the region braces for an expanded Israel Defense Force (IDF) incursion into the Gaza Strip – a possibility indicated by the government approval of a mobilization of up of 30,000 reservists. Such a move would consist mostly of air and ground forces, but the Israeli Navy would also have a role to play. 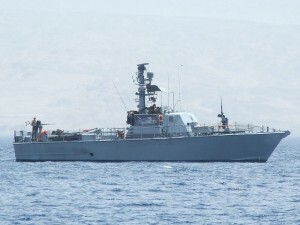 The bulk of the Israeli Navy consists of these missile boats and patrol craft, plus a handful of more-capable corvettes and subs. Missile boats have already shelled (and perhaps struck with missiles) Hamas security positions along the coast, and the Navy continues to enforce its blockade of the Strip. As Dr. Robert Farley and Galrahn, a pair of prominent naval bloggers (see our @CIMSEC twitter stream conversation), say naval options during this and expanded Israeli operations will mostly be confined to further shore bombardment and interdiction, along with ISR and effective surgicial strikes ashore. Martin Skold, another CIMSEC member, notes that the normal missile load-out of Israel’s naval platforms limits the frequency of such strikes, especially when options such as the F-16 are readily available. 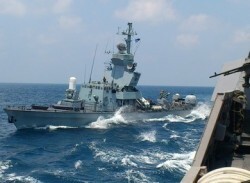 On the flip side, Israeli naval vessels may tempt Hamas as targets – especially as with the case of the Hezbollah attack on the INS Hanit in 2006 if they let their guard down. It will be interesting to see if Hamas has the capability to attempt a similar strike. Other scenarios tossed about for expanded fighting in the region include Hezbollah in Lebanon, and Egypt. The latter would present the greatest naval challenges with 6 American-built frigates, 4 Romeo-class submarines, and roughly 200 other ships and craft. 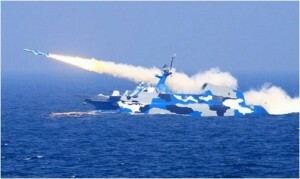 But as the former showed with the Hanit, one should never count out the damage non-state actors can do to a Navy. How to keep the missiles in their tubes? The panel debate last month at the Center for Naval Policy on U.S. strategy in the Asia Pacific helped start a discussion on potential strategies and the tools each would require. I served up my initial thoughts here. As I noted, one of the difficulties in balancing the ends, ways, and means in any strategy designed to win an armed conflict is that the tools to win are not necessarily those that can help prevent the conflict from erupting in the first place, or to keep a conflict from escalating. In many ways a similar check acts to keep sabre-rattling from becoming sabre-thrusting due to the intertwined interests of the U.S. and China. In this arrangement, the devastation swiftly wrought by a conflict would be economic, and the blast-radius global. So, in an effort to coin a term that I’m sure will become widely used, I give you Mutual Economic Obliteration – Worldwide, or MEOW. Yet an oft-repeated fact is that the unprecedented levels of economic interdependence in Europe prior to World War I could not prevent that war’s outbreak. So it is today. Economics and rationality maximizing polices of nations can certainly help, but can not alone prevent a conflict in the event of a range of scenarios driven by nationalist passions, the self-interests of individuals, or just plain accident. So how can the U.S. aid prevention in these cases? Nothing can completely eliminate the possibility of armed conflict, thus even the most pacifist of prudent nations retain militaries and self-defense forces, but there are steps available beyond economic co-dependence. These can be categorized as those steps taken to sow respect (often involving means useful in the event prevention fails) and those taken to enhance familiarity. I will explore some of the options available in the next post, but by no means have all of the answers. In an environment of fiscal restraint and a time of hard budgeting choices we can’t lose focus on the importance of trying to prevent conflicts as much as we prepare to win them. Financial resources, time, and creative energies are needed for both equally important endeavors.